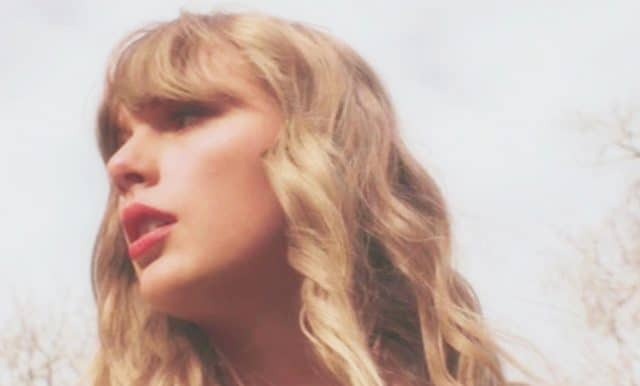 Antioch Waffle House shooting suspect, Travis Reinking in a May, 2016 police report claimed pop star, Taylor Swift (pictured) was stalking him. Antioch Waffle House shooting suspect: A history of mental illness and delusional claims including being stalked by Taylor Swift and desire to meet Donald Trump to discuss policy. Guns seized only to be later returned to Tennessee Waffle House shooter. Reports have told of Travis Reinking, 29 who opened gunfire at a Antioch, Tennessee Waffle House killing four and injuring four and presently on the run being on record for being ‘delusional’ and ‘mentally unhinged’. The dailymail reported federal authorities shortly after revoking the assailant’s gun license along with four of his weapons being seized by authorities at Reinking’s Tazewell, Illinois residence in October. The guns, however, were eventually returned to Reinking’s father who has since admitted to giving them back to his son. The AR-15 rifle used in the Waffle House shooting was among the four weapons. Police recovered three of the four guns that were originally taken from Reinking, but believe he is armed with at least one handgun. Authorities seized Reinking’s weapons after Reinking was arrested by the Secret Service for crossing an exterior security barrier and charged with unlawful entry. Following his arrest, Reinking told Secret Service officials he was trying to set up a meeting with President Donald Trump. Of note, the arrest report didn’t indicate that Reinking wanted to kill the President. Prior to the White House incident, police reports described Reinking as delusional and talked about his mental health issues. Pictured, Antioch Waffle House shooter, Travis Reinking and pop star, Taylor Swift who he accused of ‘stalking’ him. Antioch Waffle House shooter insists Taylor Swift stalking him and hacking his Netflix account. In May 2016, deputies from Tazewell County were called to a CVS parking lot where Reinking complained to officers that Taylor Swift was stalking him and hacking his phone, and that his family was also involved, according to a report released Sunday. Reinking told the officer the ‘harassment’ began a few weeks earlier when he accused Swift of hacking his Netflix account and ‘telling him’ to meet her at a Dairy Queen. The police report noted Reinking alleging upon showing up at the meet spot, Swift running off and disappearing. The report also noted the assailant’s parents saying his son making comments about killing himself and that he had access to ‘many firearms’ in his residence. Soon after Reinking, in the fall of last year moved to Nashville, with some wondering whether the move may have had anything to do with the assailant seeking to be near the pop/country superstar. Upon moving to the area the gunman took up work in construction. In August, after the White House incident, Reinking told Tazewell County police that he wanted to file a report about 20 to 30 people tapping into his computer and phone. He also complained that people were ‘barking like dogs’ outside his residence. Reinking agreed to go to a local hospital for an evaluation after repeatedly resisting the request. Antioch Waffle House shooter: pictured cache of weapons that had originally been taken away from the suspect. While a May 2016 police report noted, ‘Travis is hostile toward police and does not recognize police authority. Travis also possesses several firearms’. The Metro Nashville Police Department said arrest warrants charging Reinking with murder have been issued as authorities continue to search for the gunman. Following Sunday’s shooting spree, Reinking remains on the loose, with the Tennessean reporting police finding his green bomber jacket, which was loaded with ammunition, near the Antioch Waffle House. The outlet reported the last credible sighting of Reinking according to police was on Sunday morning, when he was seen in a wooded area near the Discovery at Mountain View Apartments complex, where police said he lived. He was wearing black pants and no shirt. Police added Reinking to the Tennessee Bureau of Investigation’s Top 10 Most Wanted List described him as being 6ft 4in and 180 pounds. As of Monday morning, more than 80 Nashville police officers continued to search for Reinking as a community reels from the second mass shooting in recent months. 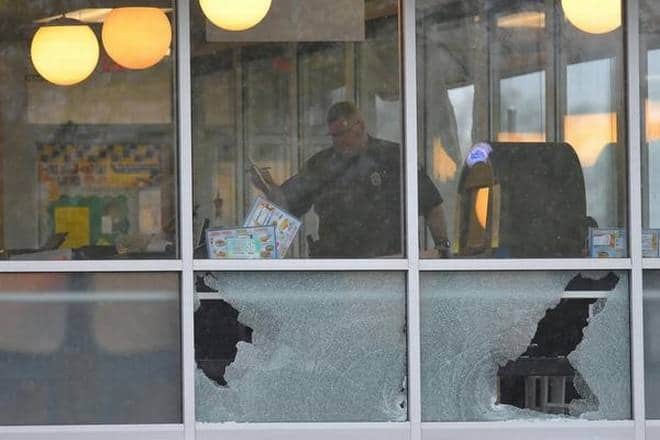 Antioch Waffle House shooter: authorities survey damage following the shooting. 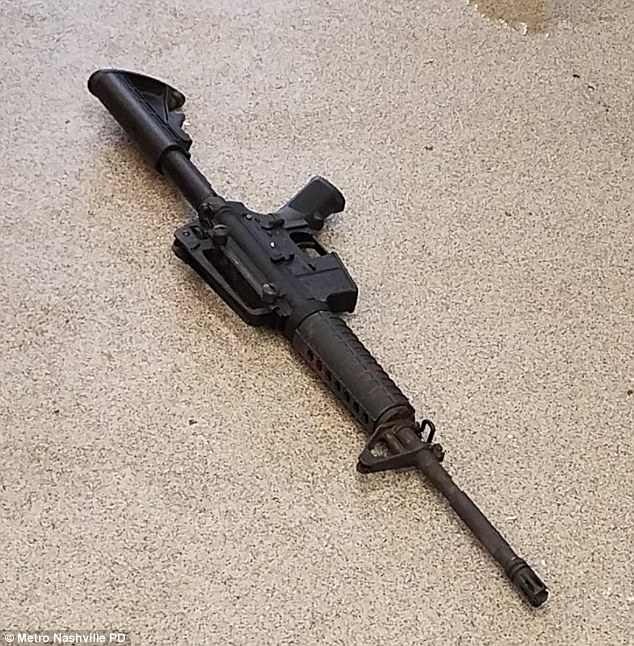 Antioch Waffle House shooter: pictured the AR-15 rifle a customer was able to wrestle away from Travis Reinking.